What happens after a disaster? The Grenfell Fire and the campaign for justice. One of the things that sometimes happens after a disaster is that the people affected by it campaign. They campaign about the disaster itself, about the social conditions that led to the disaster, and about continuing needs and injustices following the disaster. Some people involved might be new to campaigning. They become politicized through the disaster and through their campaign experiences. And sometimes their campaigns succeed. The Grenfell Tower fire and its aftermath illustrate some of these features. For the survivors, their friends, families and supporters, the tragic events, in which as known 72 people died, have led to a campaign not just around immediate needs for a home, but also for justice. This demand for justice relates not only to those who lost their lives in this case, but for all those put at risk by housing policy towards the working class and marginalized groups. In our previous research on responses to emergencies and disasters, we looked at how people behave within the event itself. We found that solidarity is common within disasters. Ours and other research shows that a ‘disaster community’ emerges in these events, and is the psychological basis of the help survivors give to each other. In those cases where disasters lead to campaigns, those affected by the disaster seek to extend the emergent disaster community to confronting the causes of their situation and holding the authorities to account. In many cases, the issue that united people in the first place becomes broadened through the act of getting together. In this article, we describe our research examining how this broadening process occurs. Globally, the working class, the poor, and marginalized groups suffer disproportionately in disasters. The poorer sections of society are often those who suffer most, both because they have fewer resources but also because they have less power than other groups to pressure governments to enforce safety regulations. For example, in the case of earthquakes, buildings collapse in many regions because building regulation codes are not properly enforced, which can be a result of corruption. In the case of Grenfell Tower, the building was populated by poorer and mainly ethnic-minority residents, and what happened needs to be understood in the context of gentrification. The flammable cladding on the building was said to have been put there for the benefit of more privileged neighbours, who would otherwise view it as an ‘eyesore’. Since 2013, the residents’ organization had expressed concerns about fire safety. They mentioned that the exit path was limited to a single staircase and that sprinklers were not retrofitted. These concerns were not heeded. As well as the causes and immediate impact of disasters, there is disadvantage in relation to the secondary stressors. Secondary stressors are those stressors not directly caused by the disaster itself but which arise because of the particular way the societal response to the disaster is organized. So, if society was organized differently, these stressors would not exist. Examples include the problems those whose homes are flooded have in sorting out their insurance. In the case of Grenfell Tower, it seems the people affected still can’t get adequate help because of the same authority’s neglect. The disaster itself made people homeless, but society’s inadequate response creates this persistent, distressing continued homelessness in the form of inadequate ‘emergency accommodation’ and dispersal away from support networks. 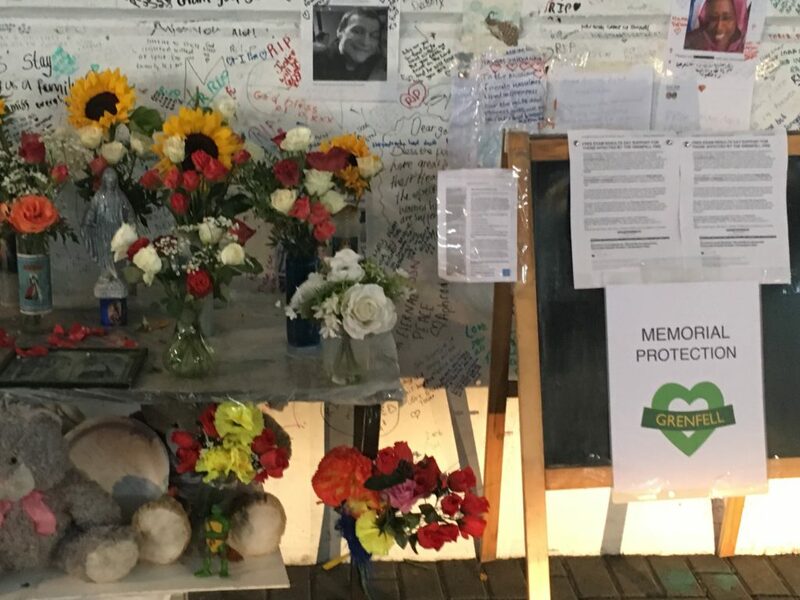 Grenfell memorial under Westway flyover. Image: John Drury. These examples suggest that different aspects of a disaster can lead to grievances. This is important in understanding what comes next, because research shows that shared grievances are one of the key predictors of protest activity. By studying closely how people understand and organize in relation to their needs and grievances after a disaster, we can better understand how this process happens. First, a disaster throws people together. In many cases, people get together to meet basic needs – for survival, for subsistence, for comfort. But, second, coming together means that they are able to share experiences. It allows them to develop a common perspective on their predicament. It also means that they come to see themselves as a group and it creates an opportunity for them to organize – to coordinate their activities. In our research on the July 7th 2005 London bombings, we came across some survivors who organized themselves into a support group to demand that the government put more resources into supporting survivors and their families after such incidents. There are other examples. In Kobe, Japan, following the earthquake in 1995, the trade unions and chamber of commerce joined to lobby a resistant Diet to provide financial assistance to rebuild in Kobe and to provide employment to those made unemployed as the result of the disaster. When the authorities are accused of neglect following a disaster, they may deny it and try to undermine the credibility of survivors and supporters who are criticizing them. Where the survivors and their supporters are already in a marginalized group, this delegitimization is often something the authorities are doing anyway. Hurricane Katrina is a disaster which can serve to illustrate these points about structural violence and the pathologization that sometimes goes with it. Here, while one part of a city received help after the disaster, another part was neglected. The mass media portrayed the black working class survivors as ‘barbarians’. Their survival behaviours, such as taking food from shops, were represented as atavistic ‘looting’. The fact that they didn’t evacuate was falsely attributed to their free choice. These constructions were consequential, because they served to legitimize the military, rather than humanitarian, response of the government to the survivors. Not all disasters develop into campaigns. For example, after the Chile (Maule) earthquake of 2010, many people who lost their homes were put into temporary camps or were left to fend for themselves. The issue for them shifted from the earthquake itself to the way they were neglected by the authorities – but this grievance didn’t develop into a campaign. Both theoretically and practically, therefore, there is a need to understand the process – how do post-disaster campaigns develop; how do they succeed or fail in meeting their needs? A key issue for the development of a disaster campaign is surely its ability to get support from others outside the immediate group of survivors. Following Grenfell, many groups of people (marginalized groups, as well as the wider working class community in the local district) came together to protest about the fire. They are not only protesting about the fire itself; they also protest about the wider unequal social structure, because the fire clarified that different social groups receive different treatment by the authorities after a disaster. The involvement of wider support groups helps sustain the survivors’ campaign. Survivors on their own may have the advantage of claiming the ‘moral high ground’. But they are stronger if their demands are understood as representative of a wider grievance, one that affects many more people. When authorities and outgroups attempt to circumscribe the issues surrounding a disaster, by suggesting a narrow scope for any enquiry for example, this can function to isolate survivors. Likewise with attempts to demonise survivors and their supporters. For the authorities, the broader the scope and the broader the campaign for justice, the greater the threat. By building wider support, such campaigns can succeed in their attempts to get justice and to hold the authorities to account. In the case of Grenfell, the fight for justice is already a campaign against gentrification and for proper regulation of social housing. Implicit in these battles, and perhaps becoming more explicit as the campaign meets resistance, is the fight to change the very society that allows disasters like Grenfell to happen. If the changes required to prevent another Grenfell require collaboration, perhaps the same can be said of research to understand post-disaster campaigns. It is important to understand what is happening in the aftermath of Grenfell. But the point of studying it is to help contribute to change. In the longer term, we hope that our research on post-disaster campaigns can produce lessons for future campaigns. In the short term, we will volunteer and seek to offer solidarity, like any other supporter, neighbour, and friend. Fascinating article. In the case of Grenfell, there’s another dimension in that 11k people are estimated to be affected by the disaster. As a result, a large amount of public funds has been spent locally, ostensibly to meet the support needs of these people. However, since almost all of those 11k have received no communications or information about these services (or indeed about anything else associated with the disaster or the response to it), their access to support is somewhat hindered. Publicity materials about services are produced (mainly for show), but not distributed. The ongoing sense of abandonment is raw and widespread, and the refusal of statutory authorities to respond or learn is another part of the structural violence being done. Thank you for sharing this article! It’s fascinating and infuriating in equal measure – great that communities can come together and successfully build a campaign for change, but awful that they have to because the response from local and national government is so weak. I really hope you can develop a framework for future campaigners.